This day will forever be burned into my brain and into my soul. Since it was Tuesday, we dropped off Caleb on the way to school in the morning at Miss Lora's house. I dropped off Jeremy at work, right next door to the preschool. Tuesdays and Thursdays are my 'easy' days at preschool, since I've only got 4 girls in class. The day went off without a hitch. Actually, I remember mentioning to Jeremy that the morning got off to a good start. After school was over, I called Jeremy to see if he wanted to come with me to pick Caleb up, since I have to come back to the area to work at the gym. Then we could all do lunch together as a family. I am so so thankful that he did. When I pulled up to the shop, he opened the door with a big smile, looked at me and his baby girl, and said "I swear this is the best part of my day." 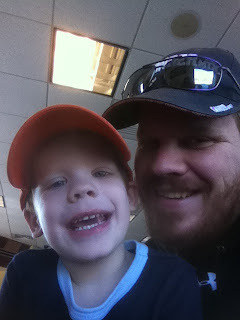 We decided to have lunch at a KFC/A&W that we had only stopped at once before, actually just a few weeks ago. I remember specifically the sweet lady at the counter telling me she remembered my 'sweet little family'. And I remember beaming with pride. We drove Jer back to work. He actually sat in the passenger seat for a minute before getting out. He gave a big heavy sigh, put his hands on my belly and asked me how Carter was doing. I said fine, and he leaned over and kissed my belly (which he doesn't usually do except at bedtime). He told me he was going hunting in a bit after work, and I gave a pouty frown. He told me not to worry since sunset was early, he'd be home by 6:30-7:00 and he promised we'd spend some time together. Jeremy sent a text to his buddy Mark (and boss) at 4:34pm. Something regarding work. At the exact same minute, I sent him a text. A simple "I Love You"
But, he didn't text back. At about 6:30, I text him again. Then again. It wasn't like him to not text back, so I called him. No answer. Finally, just after 7:00, I text our friend Jon asking if he'd heard from Jeremy at all cause I hadn't. Neither had he, but he told me it was possible if Jer had got a deer, he'd be covered in blood or dragging it out of the bush and unable to get his phone. That's what I figured too, so I left it alone for a bit. My sweet friend Sarah, and her sister Jennifer came over to watch Glee. I was telling them I was worried about Jer and kinda mad he hadn't written me back. Then we went on and on about how Jer had to listen to the A Cappella song in the episode, cause he would have loved it. Maybe he might actually like the show. Jon text me again around 9 to see if I had heard from Jer. I had not, and Jon said he was gonna get Mark to go look for him. It wasn't right that he wasn't home well past sunset, and hadn't called anyone by now. I knew he was right, but never in my wildest dreams imagined the unimaginable. 10:46pm: I text Jon to see what was going on. No was answering their phones and I was getting worried. 10:48 Jon called me. The next few seconds are a blur. I remember Jon saying that Mark found Jer and thought he was dead. I was screaming at him saying it couldn't be happening and it wasn't funny. He told me the paramedics were there and working, so I was sure he'd be fine. But he'd been out there so long already. Next thing I know, Sarah and I were driving as fast as possible up to the spot 20 minutes away. I remember hyperventilating, but no tears had come yet. I wouldn't let myself believe that my 31 year old, 6 foot tall, 225 pound husband would be dead at the bottom of a tree stand. It wasn't possible. Eventually, the phone was handed to Mark who could only repeat "I'm sorry." And I couldn't. Everyone else did it for me. It seemed to take hours before they brought Jeremy out of the woods, and they convinced me not to be there to see him. Even though I saw him the next day at the examiner's office, I regret that I didn't see him then. I think my nightmares are much worse than reality. I watched the vehicles drive away. I sobbed the entire way home. My heart had broken into a million pieces, and could literally feel them shattering. I couldn't and still can't understand why this is happening. It hurts to write this. To relive this. But I keep reliving it in my head every hour and I needed a place to write it all down. I'm not sure where to go from here, I'm still suffocating with pain. I don't know where to go, what to do, and what to even ask for. Most people don't know what they have until they lose it. I knew what I had, and I loved every minute of it. If you couldn't tell from my blog, my husband was an incredible man. And I'm terrified of figuring out life without him. My heart is just breaking for you. Praying for you as you find your way. I can only sit here and cry at the thought of the pain that you are feeling. I came to your blog last week after seeing mutual friends post something on facebook about a tragedy. I am so very sorry for your loss. Please know that there are people you've never met who are praying for you. I cannot even begin to imagine the pain you are feeling every minute of every day since this happened. Oh Vee....I am so sorry and I wish I knew what to say but I cannot seem to find the words. Just take it 15 minutes at a time and just continue to pray to God to help you find the way. I am forever praying for you and your little ones. If you need anything at all please please do not hesitate to call me. I love you! oh veronica, i am so sorry beyond belief for your loss!!! i know that you and jeremy had an incredible relationship and were perfect together!! i love looking at your family photos and seeing both of you so happy to be together/with your children. i am have been thinking about you constantly and always praying. i know it must have been hard, but thank you for sharing. it just proves to us all once more how much jeremy loved you and how much you did NOT take it for granted and treasured every minute of it! Oh Vee! My heart hurts for you. Sending thoughts and prayers your way from the Midwest. Oh honey, the tears are streaming for you. You experienced a love that many of us only dream about. Keep writing, or doing whatever it is you need to do. The prayers are plentiful for you. Oh God Vee I'm so sorry. I was just dreading this post, but am so glad you wrote it. I don't know what to say except that I am praying for you and your kiddos. Just take each moment at a time and take care of yourself. My heart breaks for you! Although I can't comprehend what you are going through, there are many people that have lived through something similar that you are going through. Reach out to them....they get it, while others may not. Matt Logelin is one (http://www.mattlogelin.com)....there is support to be found there. Reach out when you feel ready. You and your family will be in my thoughts and prayers!! Praying for your and your family sweet girl. God is with you, Vee. I've just started reading your blog and I am SO sorry for your loss. Just know there are many people you don't know praying for you and your kids everyday...so so sorry! A week may have gone by, but we have not (and will not) forget. We have been lifting you up in prayer constantly and will continue to do so. There are no words to express how sorry we are for this loss. Veronica, I knew your hubby in highschool. Jeremy was a wonderful guy. May God heal your unimaginable pain. Strength to you today. My heart is truly breaking for you. I wish there were some words I could say to take away the pain you feel. I am praying for you all. I'm so so sorry this has happened to your family. I'm praying for y'all as well. I'm sorry to have found your blog through such heartbreaking circumstances, but you have a network of some wonderful people who love you and are asking for prayers on your behalf. Please know that you have an entire country praying for you and your family. There really aren't words...all I can muster, for now, is that I'm so glad your before was so beautiful. I can't find the words, I don't know if there are any, except, I am so very very sorry that you have to go through such an unimaginable loss. :( I continue to pray for you and your children, and entire family. My heart is breaking for you, a woman who I don't even know, but I feel so deeply for right now. You will continue to be in my prayers. There is nothing I can say, or anyone can say that will ever make a difference, or make the pain go away. The tears will not stop falling as I read this and think about you and your loss. I think it is impossible to ever understand why people have to be taken from us. It doesn't make sense, it never will. Our only "hope" is to cling to God, and to the things we believe and know that we can be together again someday. All you can do is take one minute at a time and breathe. You are greatly loved, that is obvious, and many prayers are being offered up in your behalf. I wish there was something that could be said to comfort you and your babies. I'm so very sorry for your loss. I loved him like a brother. And so I love you, too. And your sweet children. You are amazing. Sweet Veronica, thank you for your openness and vulnerabilty in sharing these dreadful events. Hurting out loud with others will help you heal. There is no magical formula to how many hours, days, or weeks it will take you to grieve and move forward but just know that you will begin to live again and pick up one tiny shattered piece at a time. May God give you the strength you need for today. We are praying for you and we are so sorry for your incredible loss. It is clear from your Blog that you had an amazing relationship with your husband and it is heartbreaking to imagine how heavy your heart must be with grief. Hold tight to these precious memories and draw closer to God. He will carry you through this nightmare. How blessed your children are that you can share all of these memories and all of these wonderful pictures with them. You are in my prayers daily. May God bless and comfort you all. It's very obvious that you love your husband and how awesome he is. I'm glad you have that last, good family memory of lunch together. Prayers are with you and your family. Praying for you and your sweet family. I came across your blog from another, & wanted to let you know that I am so very sorry for your loss. I can't imagine the pain that you are going through. My thoughts & prayers are with you, your babies, & all that knew your husband. I'm so sorry for your loss. I pray that God continue to comfort you during this difficult time. I am broken for you, Veronica. I am learning what it means to pray continuously. Willing to walk this journey with you, friend. My heart is aching for you. I can't imagine being pregnant and having to go through this kind of tragedy. Your hubby sounds like he was a wonderful man. I'm praying for you and your sweet family. Someday you'll be able to breathe again, but for now it's okay to let others do it for you. I'm sure they're more than happy to help you out. Like others have said, keep writing. It might help you figure all of this out and find a small token of peace. I am praying for you & your family. I'm so sorry! Please, God, comfort this family! Give Vee the strength to face each day & to love on her sweet babies. Tears are streaming down my face... my heart is broken for you. Praying for peace during this time. I am so sorry for your loss. I am so incredibly sorry for your loss. I can't imagine the pain you're going through. I wish for peace for your family, and send my deepest condolences. Vee, I am so sorry. So very sorry. I will continue to carry you and your little ones in my heart. I will continue to pray for you. Daily. All I can do is sit here and cry for you as I read this. I can't even imagine, bear, understand what you are going through. All I know is that some people don't have crazy, intense, passionate, FUN marriages and they are really missing out. Not many people understand what you are going through exactly, everyone has an interpreatation. Just know that we are ready for you when you are ready for us. I was baking cookies today and I wondered if you would like some. :) Not many moments go by when you aren't on my mind or in my heart. Keep writing, friend. We'll keep reading. This is unimaginable. Just know I'm crying for you and praying hard that you and your beautiful children find peace. I am so incredibly sorry. Vee, I came across your blog after hearing your story from my sis-in-law who went to high school with Jeremy. I can barely breathe after reading your account of finding out this horrible news. It is so apparent from this blog (seeing as we've never met) that you and Jeremy had an incredible relationship and loved each other intensely. My heart aches for your loss. I can not imagine how difficult this must be for you and your children. It sounds as if you have lots of family and friends surrounding you and praying for you. I will certainly continue to pray for you constantly <3 I know you will strive to stay strong for your precious children, but I do hope you will lean on the people who love you as much as possible to get through this. I am so so sorry for your loss. My heart is breaking for you. I have no words to say because what could I possibly say that has not already been said. Your in my thoughts and prayers every day. I hope you know that you are very much loved in the community and everyone is praying for you. We are continuing to pray for you and your family during this unimaginably, difficult time. I keep reading this post over and over again. I'm so sorry seems so stupid and trivial...it is. People all over this continent are praying for you...we won't stop. And if there's anything more we can do -now, or later- please, please, please let us know. unreal...I can't even begin to understand what you are going through right now. I lost my mom when I was 21 completely unexpectedly and it was and continues to shake me to the core just thinking about it and replaying the memory of it in my mind. I forget to breath just reading your lines...living this nightmare is unimaginable. I don't understand life and particularly things like this. It's just very unfair and so frustrating because it can't be reversed ever. Keep the beautiful memories you have, think of how much he loved you and think about the amazing children you have from him, think about Carter whom you are going to meet soon, think about the legacy Jeremy leaves behind and of all the amazing things you will be able to tell your kids about their daddy. You know what Jeremy would tell you if he could hold you right now. Give it all you've got to do what he would ask of you do to. That I think is what is next and where you need to go. It's a challenge to figure out the "how" part of it, but you have it in you Veronica. You are a very strong woman!! Love and prayers, V. I share your pain in the hope it aids the healing. Never forget, and never give up. Love truly conquers all. I am crying for you and so very sad for your family. God bless you in this difficult time. I am so sorry for your loss. Saying a prayer for you and your family. Psalms 116:15- The death of God’s children is precious. He mourns with you. Not only are your friends, family, and strangers mourning for your loss...God is too. Rest in Him. Lean on everyone else. You and your children are constantly being lifted up in prayer. Vee, I know I don't have the right words to say. I am sorry sorry I missed this post I've been a horrible blogger lately. All my prayers are going to you and your family right now. This isn't fair and I am so sorry that this is happening to you and your babies. my heart is breaking for you... this heaviness just came over my chest and my body got the chills as I read your nightmare. I keep typing and deleting and typing and deleting.. even having gone through this, I still can't find the perfect words to say to someone else. What you are going through is my worst nightmare. I am so sorry that you are having to experience the kind of pain that you are. I pray that as the days go on, the pain will lessen, and the happy loving memories will surround you and give you strength. The love that you and Jeremy shared is the kind of love that we should all aspire to have in our marriages. So many are aware of this tragic story, and I can only hope that it's a reminder that life is fragile, and all of the moments truly matter. RIP Jeremy, and may God watch over Vee and family. I found your blog through another FB friend. I am heartbroken for you! I don't even know what to say. I will pray for you to give you the strength to get up everday and smile at those wonderful kids of yours. It will be hard but know you have a huge support in prayer! I have no words besides that you and your family are in my thoughts and prayers. Take care. My heart is heavy for you. I pray God will give you comfort and strength. I can't imagine what you are going through but know that your family is in my thoughts. I'm sorry for you loss. hey Vee - how's it going today? I read this last night and wept and sobbed and on and on. love you, Hon - give the kids a farty kiss on their cheeks from uncle Roger. Veronica you don't know me, but I read a post on Erynn's blog and have known this pain so I feel compelled to write. My heart aches for you and for your sweet babies as you all face this unwanted new reality. You are not alone on this journey, which may mean nothing to you now, but I hope you find some small comfort in that in the time ahead. Know that even in your darkest hours God's arms will wrap your family up and hold you through this nightmare. Take it one breath at a time. Love is the only thing that never dies. I found your blog through a friend who was praying for you. The link caught my attention because my name is Veronica and my family calls me veron and my maiden name is king. I go by V now. I couldn't read your heart and not comment. I am incredibly sorry for the loss of your husband. Please know that I am praying for your precious family. You are an amazing testimony. Your strength in weakness, though not felt is awesome. At some point you are going to have the strength to have such a powerful story to share to bring healing to others. That's what's to come at some point. Right now give yourself the permission to hurt, grieve and even be angry. It's where we all are but not where we will ultimately be. No one should have to feel the pain that must exist within your heart. We see how you care for your "children" at the preschool and one can only imagine how you care for your loving family. You have an inner strength and beauty that is evident immediately upon meeting you. We pray you find the peace within your own soul and the contentment from your three precious children's souls to perservere. You don't know me. And I don't know you, but I have thought about you at least daily. I'm praying for you and your babies. Please accept my deepest and most heartfelt sympathy during this time that words cannot begin to describe. Vee, you do not know me - but our mutual friend, Kelli Turner, asked me to contact you. My name is Sarah Schieber, I am a Contemporary Christian singer . . .and three years ago now I was widowed suddenly at the age of 33 as my beloved husband, Chad, and I were running the Chicago Marathon. In one heartbeat I became a widow and a single mama to three wonderful children. I learned to breathe in and breathe out . . . for it was all I could do most days. I learned that our most loving Heavenly Father can handle ALL of our emotions and is so faithful to be all that we need Him to be. I learned that it is OK to hurt and that, while there are many promises in the bible, it is also true that sometimes our lives have Job 3:25 seasons . . . "what I feared has come upon me, what I dreaded has happened." Please allow yourself the space to weep, to struggle, to question, and to feel every bit of it. Your babies need you to be whole for them someday and in order to get there you must mourn. THAT . . .is ok. Please check out my blog and website when you can find it within you . . . www.sarahschieber.com. I would be happy to speak with you or come visit you. It really helps to just speak with someone who has been there. My children and I will be praying for you and your babies! All our love . . . I was so sad to hear about your loss. I hope to give you are real live hug someday. I have been praying for you so much and for your children. I know February will be bitter sweet to you. I pray that you are surrounded by loving arms and feel the love of Christ during the difficult months to come. God bless you. Praying for you and your family. You have all been blessed by a wonderful man, who was proud of his family. Your love for eachother will only make you stronger during this time. Stay strong. Take care. Smile in his memory. Love in your future! *Hugs* I'm new to your blog, I follow DaisyGirl (Jen) who wrote about you... I am SO sorry for your loss. I know there aren't any words anyone can say that will ease your pain. My thoughts are definitely going out to you and yours during this difficult time. My heart breaks for you. I'm so sorry to hear of this devastating loss. My heart to yours, love. I am so very sorry of your loss, Vee. I was catching up with the blogs that I've missed as I just had my 3rd, and was shocked to read your news. My heart is aching for you and though we don't know each other, please know that I am praying for you, from one wife, one mother, to another. My heart is breaking for you. I know nothing we say will make you feel better. May time heal your broken heart. My thoughts and prayers are with your and your children. Vee, my heart hurts for you and your sweet babies. I think about your family every day. Our family experienced an awful tradegy in 2009. My daughter Erynn was 7.5 months pregnant with her 2nd child when her husband & father in law were killed in a plane crash. It's been a very long and painful process. Please know there are hundreds of people praying for you and your family daily. I pray the Good Lord will bless you with strength & courage each and every day. Much love to you. Teresa Fackiner. Dearest, dearest girl, we love you, we love Jeremy. You two have meant so much to my family and you always will. You are not alone. Don't worry about what to ask for, there are those of us who have gone before you and we can help you with the asking and the listening and whatever you need. We will be there because you are incredible and Jeremy was incredible and there is a race to be finished and you don't have to run it alone. Shelby said that he wanted to keep hugging you and hugging you at the funeral, he loves you both so much and he just wanted to share your pain. He said that he had always seen Jeremy as a mentor. I didn't even know that. You were there for my son when he needed someone; that's God's grace and for that I will always be thankful. This is Joan, you know my family, fractured and broken as we may be, we love you and we will be there for you. You don't have to ask, just call. We'll be there. We love you more than words can say. I know it doesn't seem possible now, but you will go on and we will hold you and your family and hold your hand and bear you up along the way. Jeremy may never hold Carter in his arms, but he will know him, and Carter will see his father every day in the people you both have touched. Cold comfort now, I know, but Jeremy lived a magnificent life. Our Father doesn't forget His own and we won't either. We love you very very much. I am so sorry for your loss...I am praying for you and your children continually! Jeremy was a great man, and I knew that by his amazing example. I pray God's comfort and strength on you right now. It is so very clear that Jeremy's love for you and yours for him, was so special and strong that it will always live on. I am thinking about you and the children, Vee, praying for you during this season, in which we are taught in Advent to wait in hope for the coming of the Lord, for the peace of God to be with us. I wish it especially for you and your children. I am so deeply sorry for your loss. I know that your memories of your beloved husband will be made wholly alive again as you teach your daughter and sons about the kind of man he was; and I promise you, there are many smiles, and much, much joy coming for you in the years ahead. But for your pain, for the keenness of your loss and loneliness now, I pray that you will continue to feel and know Jeremy every day, and that God will be omnipresent and tangible in your life in your grief and mourning. I'm sending you my love as a sister in Christ. Peace be with you. i'm a stranger to you, but i too am a mother. i am so so sorry for your incredible loss. the magnitude is deafening. please know, even in this dark and blurry time for you, the love you and your husband shared has changed the world. your children will never be without that love. never ever. i'm so sorry. so so sorry. I am so sorry to hear what you've been through and of your loss. I am praying tonight for you and your family. I have read your blog before, and what stood out to me was how much you loved your husband. My heart is breaking for you. I am so, so sorry for your loss. The other thing that is clear from your writing is that you know that God is real and in control, even when it doesn't make sense. I pray that your faith will continue to hold you up. Know that every Christian who reads this will be lifting you and your children up in prayer. My name is nicole and I'm 16 and a few years ago I lost my father. He was such an incredible person and father to me and my sister as it sounds your husband was as well. I just wanted you to know that your children are going to be alright because although they suffered a tremendous loss they still have their incredible mother with them. Through the immense grief my mother was suffering she continued to be the amazing, supportive parent she always was. Times were not easy for any of us but I'm so grateful that I still have her by my side. I will never forget my father or my own worst day when we lost him but my mothers continuing love has helped me to continue on with my life. It is clear that you have such an incredible amount of strength within you and your children are so blessed to have a mother like you. I know it's not easy but I also know you will be okay again. As I think of you I will lift you up knowing that God has you in His hands even when it doesn't feel that way. I cannot imagine what you and your family are going through. My thoughts and prayers are with you during this time. I've never seen your blog before today, and didn't have the joy of knowing Jeremy and what an incredible man he was, but my heart breaks for the loss you and your children are suffering. I pray that you will have peace and feel joy again. I am so sorry you have to go through this. I know what it feels like to be scared of your own mind. Taking a shower and the moments before you fall asleep are the scariest because your own mind seems to terrify yourself. I forgot how to breathe too. Oh Vee- I'm so sorry for your loss and the pain you're going through. I'm praying for you!! I found your blog only because a blog friend of mine wrote about yours and mine in her recent blog post. I am so deeply sorry for your loss; I cannot imagine what this must be like for you, with young children and one on the way. I dont' know what I would do if I lost my husband...I just don't. My heart hurts so much for you. Please know that I am lifting you and your family up in prayer today and in the days to come. I just lost my little brother on Tuesday. While our situations and circumstances are different, pain is pain. Losing a loved one is just hard. I am thinking of you, praying for you and crying for you out here on Maui. Sending you lots of love and Aloha, sweet girl. I was reading another blog and they linked to your blog. I am reading your story and am just crushed. My heart is breaking for you right now. I can't even begin to imagine. I just want you to know that your family is in my prayers. I may not know you but people are people and we all hurt the same. And I hurt for you. You are in my prayers. I am so incredibly sorry for your loss. You, and your family will be in my prayers. I came to your blog from a friends post on facebook, I am so sorry for you and will be praying for you and your family. I am so sorry for your loss. I am praying for you and your family. I found your blog through the Pennies on a Platter blog that I got sent by a friend who heard about your story. I've read this blog entry three times and sob every time I read it. My heart just breaks for you and your babies. Wow. I am praying so hard for you. He is so faithful. I don't understand why, but I know WHO is in control. Vee!!!! NO! I'm just now reading this and am just devastated right now for you. I spent a lot of time reading your blog when I wrote it up for your SITS day and honey, the one thing I walked away thinking was that you clearly have such a love for your family and your husband. Your kids are blessed beyond words to have you as their mom and their dad is an angel for bringing them to you. I am so sorry. I lost my husband of 32 to cancer while pregnant for our first child. That was on June 25, 2006. I also thought the world would end. I was so angry at God it was all I could think about. But God is good, and He has healed my heart and taken my life places I never imagined. Hang in there. Joy will return to your life. Hello Vee.. I was sent a link to your blog after complaining to a friend about my woes. Your story broke my heart into pieces. Youre an inspiration. I know vow to pray for you and your family. We have so many things/people to be grateful for.. Life is so precious. I will no longer sweat the small stuff. I cant get enough of your blog.